ARIA Award winner, Guy Sebastian returns with a brand new single 'Before I Go', through Sony Music Entertainment, available to presave now from Spotify and Apple . 'Before I Go' was co- written with Jamie Hartman (Christina Aguilera, Kygo, Jennifer Hudson, Natalie Imbruglia) & Dave Hodges (Kelly Clarkson, Avril Lavigne, Carrie Underwood,). It's the first song Guy Sebastian wrote for his upcoming eleventh studio album, out in the new year, showcasing some of Sebastians' best work to date. 'Before I Go' brings the singer songwriter's vocals and soaring delivery to an emotive and captivating place, setting the tone and anticipation around his forthcoming new music. The new song is about self belief and taking control of your own destiny and legacy regardless of the limitations people or obstacles in your path may place over you. It's a reminder and statement that Guy Sebastian is just getting started and has so much to say and share with his fans. "I can't wait for my fans to have a chance to hear my new single 'Before I Go'. This was the very first song I wrote when I sat down to start this new album and it says so much about what I was feeling at the time. In fact, the vocal is still the demo vocal from the writing session because it just felt honest. I look forward to sharing the 'Before I Go' over these next weeks and having fans get to understand that there is so much of this song that belongs to them'. 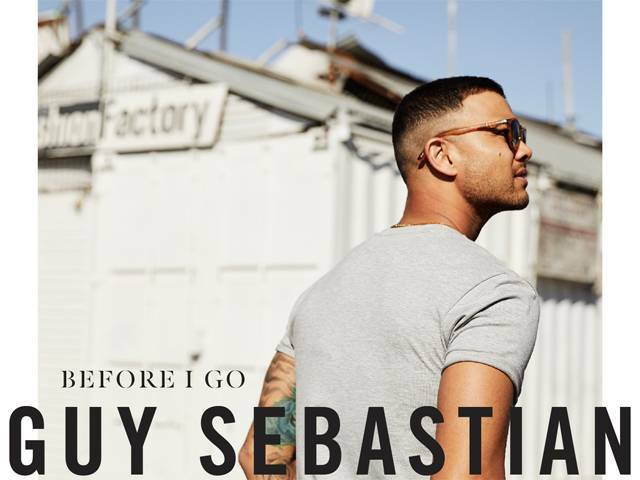 Guy Sebastian will be offering fans who presave via Spotify or Apple Music, the chance to win tickets to an intimate performance of 'Before I Go' plus other hit songs, at an exclusive event, held at Sony Music Studios. Guys Sebastian is the only Australian male artist to have ever achieved six number one singles and two number one albums in chart history. Over the course of his career Guy has received 22 ARIA Award Nominations including Single of the Year, Best Male Artist and Best Pop Artist, and won the ARIA Award for Highest Selling Single for 'Angels Brought Me Here' and 'Who's That Girl'. Guy has released 11 top ten singles, and three other top 15 singles. Six of those singles achieved multi-platinum certification, including the 9x Platinum 'Battle Scars', which also went Platinum in the US, with Guy being one of few artists in Australian music history to achieve this. With over 270 million streams on Spotify, almost 34.7 million plays on Apple Music, 61 platinum, three gold certifications and combined album and single sales over 5.1 million in Australia, Guy has one of Australia's best success stories. Guy Sebastian joins Michael Buble' and Busby Marau at the one-off closing show celebration of Sydney's Allianz Stadium tonight and will be showcasing some of his new music – final tickets are still available now from ticketek.com.au.